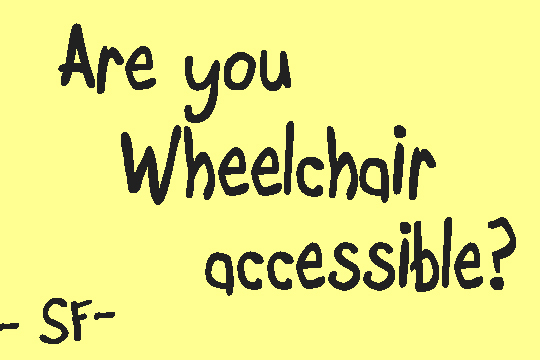 In the UK it is illegal not to have wheelchair access. My cousins boyfriend has Spinabifida and is in his wheel chair 99% of the time after a few botched operations. If he wants to use my local train starvation he has to give 24hrs notice and the exact time he is travelling as they have to close the tracks and take him across them to get him to the platform. If he goes anywhere and there is no wheelchair access he will sue, and I believe he has every right to do so as its the only way to make some companies obey the law and be wheelchair accessible. No, and I am not “taking ownership” of anything short of the entire company! Ha. Perfect. I’ll have to remember that one. I love these notes, thanks for giving me a laugh. I’m lucky my boss is cool. This makes me want to put my head down on my desk and nap. Also makes me glad I’m my own boss, because I don’t get weird post-its, and because I won’t get busted for napping! Your boss is a genius for “publishing” such amazing content, free of charge to you. You surpass his IQ by writing about it 🙂 LOVE your blog! I have a coworker whose 2nd language is English. I wish he would write sticky notes to me because as indecipherable as his comments are they are equally as offensive/racist/close-minded, unintentionally. OMG…YASSS! SO dying right now…I WISH my office manager would use sticky notes in our IM feature. I would have a best seller. This post had me in tears! They say music is universal and brings the world together. I say office BS is universal in America and we need to keep this bonding effort going! Kudos, my friend. Kudos. This totally sounds like my manager!